The GSi DMC-122 not only is a very solid yet portable dual manual MIDI controller with an organ-style interface. It offers a full set of features that you won't find in no other controller. It's a dual manual organ. It's a dual keyboard controller. It's a MIDI mixer, a control surface. Pitch bender and modulation wheel. 2 inputs for continuous pedals. Power for your USB device. Connects to your musical world. The GSi DMC-122 comes with a software editor application compatible with Windows and OS X.
store and organize up to 32 complete setups, create and store three custom velocity curves, and much more. for the DMC-122 offering the sound of VB3 Version 2. This means that the DMC-122 is not only a "mute" MIDI controller. It can be your next full featured dual manual tonewheel organ simulator. And everything is based on the most realistic Hammond B3® simulation ever. On the back of the DMC-122 there's an expansion slot. 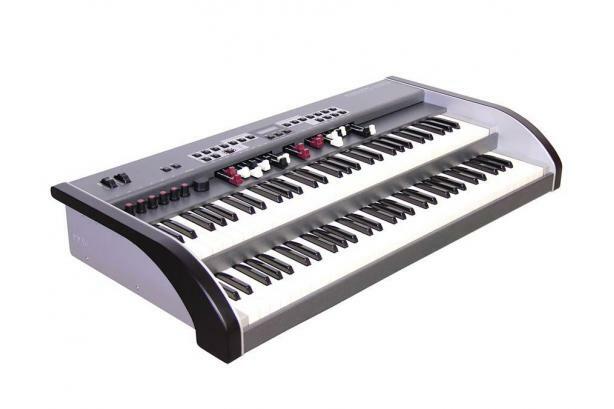 If no expansion is installed, the cover offers the fourth MIDI output. When filled with our powerful DSP engine the DMC-122 becomes a stand-alone keyboard bringing you the best of the most realistic physically modeled and sampled sounds from the decennial experience of GSi. The DMC-122 software can be easily updated at any time thanks to the Editor's built-in upgrade function.